A 12 Week Challenge to Help You Get Strong in Mind & Body. Welcome to the official site of the STRONG Fitness Transformation Challenge! This is your opportunity to work really hard and achieve your health & fitness goals – and have the chance to win a seriously incredible prize package! It’s only $97 to register for the challenge, and the winners will be selected by our team after the final submission deadline. From there, we’ll announce the winners on strongfitnessmag.com and dish out some pretty awesome prizes! Registration in now open and will stay open through the official start date of the challenge: ​Feb 4. That’s TWO full weeks to enter the challenge and get ready to rock. Get access to our community members area. Once you register your account you’ll get more details about access our members community. There you’ll find many resources about health and fitness to get you prepped for the challenge. ​This challenge is designed to give you the kick you need to finally start living a strong, healthy life. Work hard for the full 12 weeks for your shot at winning the Grand Prize. 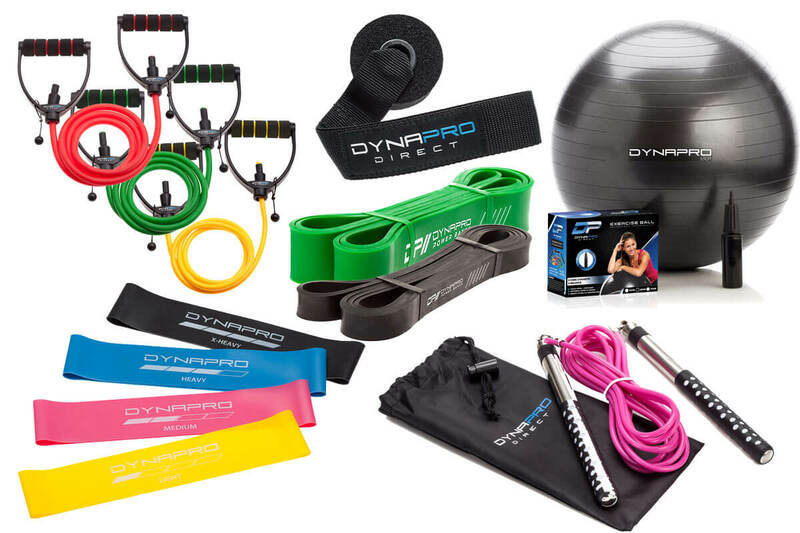 Includes: 65cm Exercise Ball, Set of 3 Resistance Bands, Set of Mini Bands, Green & Black Powerband, Black Powerband, Jump rope, Door anchor. Registration for the STRONG Fitness Transformation Challenge will open starting Jan 4th and will stay open through Feb 4th – the official Start Date of the Challenge. If you’re going to enter the Challenge, you’ll need to do it in this window. Feb 4 - April 29: Time to Work Hard! Once you’ve registered for the Challenge and are set on the program you’re following, next is the time to push it. This is the main stretch of the Challenge, so you have these 12 weeks to work hard, stay focused and build the body of your dreams. And by doing so, you’ll get a shot at winning the Grand Prize, or prizes for the other top places. The Transformation Challenge officially ends on April 29th – and we’re allowing up to 7 more days to take and submit your “before” and “after” pictures to be eligible for the Grand Prize… So MAKE SURE to get your After pictures taken and submitted – along with your Before pictures – by this date. After March 5th, we’ll close down the contest for submissions and our judges will begin going through each challenge entry. It’s a tough job. We’ll be considering all aspects of the transformation — not just the pictures. On May 5th, we’ll announce the winner of the 2019 STRONG Fitness Transformation Challenge on this page, on social media, and through the STRONG Fitness Mag email list… This is NOT the day to miss! ​​​What is the price to join the challenge? It’s $97USD to join ($392 of free bonuses). Due to the digital nature of this product, it is non-refundable. Current challenge in progress. You cannot sign up at this time. You’ll officially be entered in the challenge. You’ll be eligible to win the grand prize. A login will be sent to you along with details on how to access the STRONG Training Center, as well as all the other bonus items. There are thousands of workouts in the training center. You can choose to do whichever workouts you want. Some take place in a gym setting and some take place at home. Some require no equipment and some do. This is your chance to try unique workouts and discover new training techniques. I’m on a plant-based diet. Can I still follow the plan? Yes, you may join the challenge but our meal plan that we include with the challenge includes a variety of meat sources. However, you can follow your own nutrition plan along with the workouts in the Training Center. You can still access the $392 in bonuses. to all our transformation challenges. DISCLAIMER: By entering the STRONG Fitness Transformation Challenge, you must read these rules and disclaimers and by entering the Challenge, you agree to them. 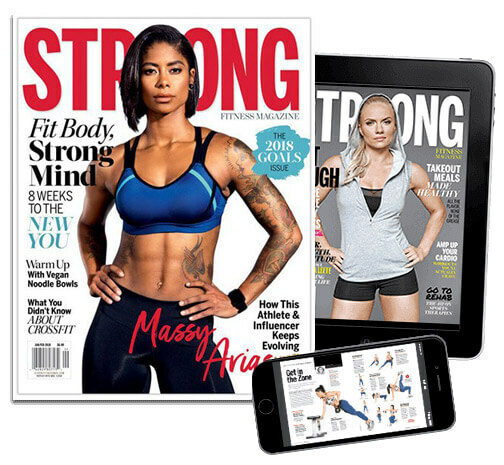 STRONG Fitness Mag retains rights to all submissions and can use all submitted material, pictures and information in any marketing material as we see fit. STRONGFitnessMag.com strongly recommends that you consult with your physician before beginning any exercise program. STRONGFitnessMag.com is not a licensed medical care provider and represents that it has no expertise in diagnosing, examining, or treating medical conditions of any kind, or in determining the effect of any specific exercise on a medical condition. You should understand that when participating in any exercise or exercise program, there is the possibility of physical injury. If you engage in this exercise or exercise program, you agree that you do so at your own risk, are voluntarily participating in these activities, assume all risk of injury to yourself, and agree to release and discharge STRONGFitnessMag.com from any and all claims or causes of action, known or unknown, arising out of STRONGFitnessMag.com’s negligence. Once you join you will still be granted access to the $392 worth of bonuses even if you don’t participate in the challenge. Due to the digital nature of this product, it is non-refundable.